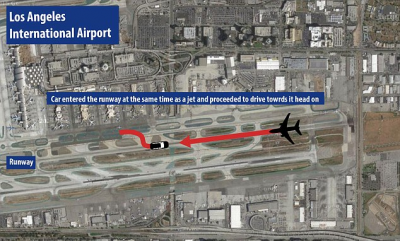 The pilots of DL 5700 immediately reduced power and slowed down the aircraft, and braked to a stop in a turnoff taxiway about 2100 meters down the runway. No collision took place. Closest proximity between the aircraft and the vehicle was about 1100 m (3500 feet). Flight 5700 was to wait for about 30 minutes to cool down the heated brakes and took off safely some 40 minutes after the incursion. 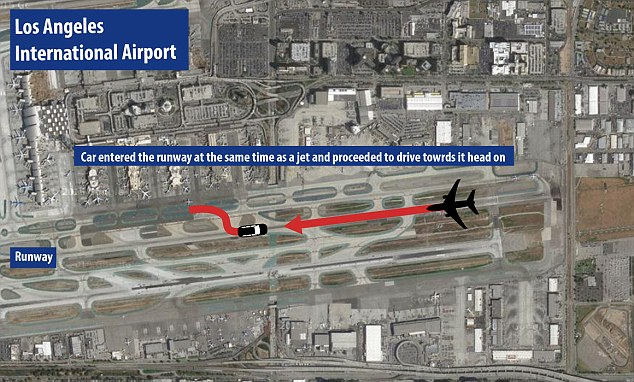 According to LAX Airport, the vehicle was driven by an airport employee who mistakenly turned onto the active runway. 2012-12-12 Canadair CRJ-200 Skywest Airlines 0 The aircraft was in its take-off run on runway 25R when the pilots were forced to abort the take-off because another aircraft – a private Challenger 300 business jet – was crossing the runway ahead of them without clearance. The pilots slowed down safely and took off about 30 minutes later. 2009-10-25 E-190 Republic Airlines 0 Both aircraft came into close proximity at Los Angeles International Airport southern runway complex when the Embraer E190 had landed on the southern runway 25L(eft) and was crossing the inner runway 25R(ight) where the Boeing 757 was just about to lift off. FAA reported only 82 feet were between both aircraft at their closest point. The Embraer crew did receive a holding instruction from LAX-tower after landing. 2007-08-16 Boeing 737-700 WestJet Airlines 0 Both aircraft came into close proximity when the 737 taxied to the ramp after landing while the Airbus A320 was taking-off. The 737 earlier landed on the northern runway 24R and failed to hold before the parallel inner runway 24L where the Northwest A320 had just gained take-off speed. The latter had to take evasive climbout to avoid a collision. According to eyewitnesses both aircraft passed each other by only 150-200 feet. 2007-05-06 Airbus A340-600 Virgin Atlantic AW 0 Both aircraft narrowly missed each other on runway 24R after the smaller Skywest commuter plane (E120) erroneously entered active landing runway where the A340 was touching down. 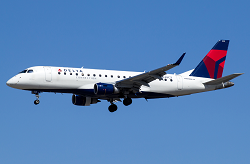 Earlier, the Skywest pilot took a wrong taxyway after landing and taxied to the correct one via the runway 24R apparently without propper clearance by tower. The EMB-120 just left the runway when the widebody jet passed it by about 50 feet. 2006-07-26 Canadair CRJ Mesa Airlines 0 Both aircraft were involved in a serious ground incursion when the just landed aircraft (Mesa Flight 2708) crossed a neighbour runway where the other Regional Jet (Comair/ UA Flight 6037) was just about to take off. The latter aircraft was forced to initiate an immediate climb maneuvre to avoid a collision. 1999-11-22 McDD MD-80 Aeromexico 0 Pilots overheared ATC hold instruction and taxied across the active runway where a Boeing 757 was about to lift-off. A collision was narrowly averted. 1991-08-12 Boeing 747-200 Air New Zealand 0 The ANZ pilot reported a near collision with the tail of a FedEx Boeing 727 during take-off.